The recent One Billion Dollar purchase of Ballast Point Brewing may have been just a blip on your local new, but here in San Diego this was Big News. San Diegans were either puffed with pride over the price tag, or horrified at the prospect of a local favorite becoming watered down for the national tastes. Ballast Point’s Sextant Oatmeal Stout is the first beer that I liked- up until I tried a stout, I thought that I just didn’t like beer… it turns out that I don’t like hops. Constellation Brands Inc. not only bought some choice brews, but included in this deal are the Ballast Point Spirits- four of which are available in cans… yow! Conveniently canned mixed drinks include Fugu Bloody Mary, Three Sheets Rum & Ginger, Three Sheets Rum & Cola, and Old Grove Gin & Tonic. This could seriously alter my adult beverage drinking opportunities! Handy guys deserve a good drink. We tried the Old Grove Gin & Tonic. Could a classic mixed drink work in convenient pre-packaging? Yes. We highly recommend it. Got a little Pre-Holiday home repair going on? This is a fine occasion to serve a drink to the guy who can take apart a Roomba while doing other home repair, too. Just not too much, at least until the vacuum is fixed. I’m pretty jealous of my friend. Her daughters attend the relatively local and highly desirable San Diego State University. They have joined a performance club that meets once a week, and tonight we were treated to their Showtunes Showcase. From torch songs to comedy, these fabulously talented students dished out some great entertainment. The Husband and I ditched the two high school boys and went off looking for the Experimental Theater on campus… getting lost… twice. We’ve never visited anywhere on the campus except the basketball stadium (Go Aztecs!). When we finally arrived at the right building we had missed the first of a dozen songs, but immensely enjoyed about a dozen more show tunes. Wow! What an amazing group of students! Seriously, if you have a university or community theater near you, get out and get viewing! I can’t believe we haven’t done something like this sooner. Seeing these girls, friends of my girl, reminded me how close she came to attending SDSU and it makes me sad… I miss The Girl. But, as The Husband reminded me, I’ll probably be sick of her malarkey after only three days this Christmas break. I’m looking forward to her malarkey. We’ve made it through Black Friday (don’t know about you, but I didn’t leave the house), Cyber Monday yesterday (did I even go online? I don’t remember), and now today has the honor of being named “Giving Tuesday.” Okie-dokie, fine by me. The Intertubes are full of clever stories of people sharing ways they have given back to the world at large. I like doing nice things, too, so I’m in. 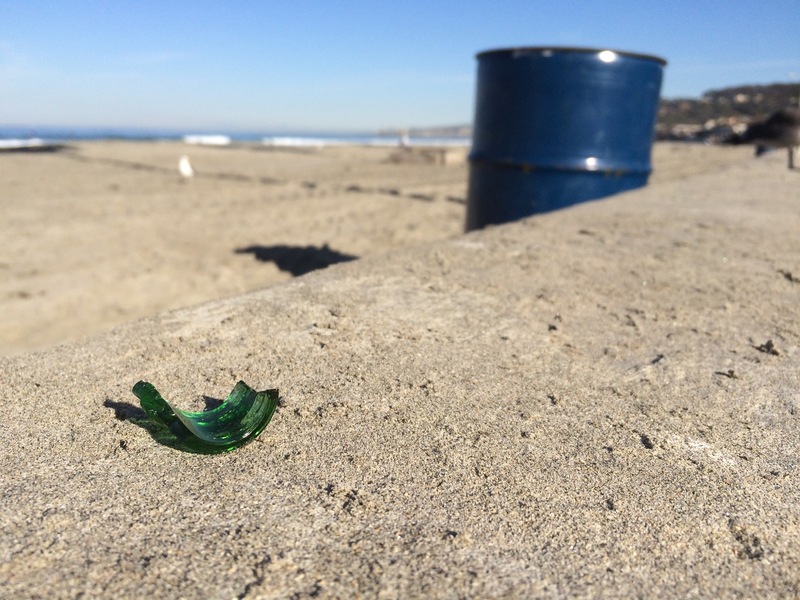 Maybe… a trash hunt on one of my favorite beaches for running- La Jolla Shores. No glass on the beach, please! 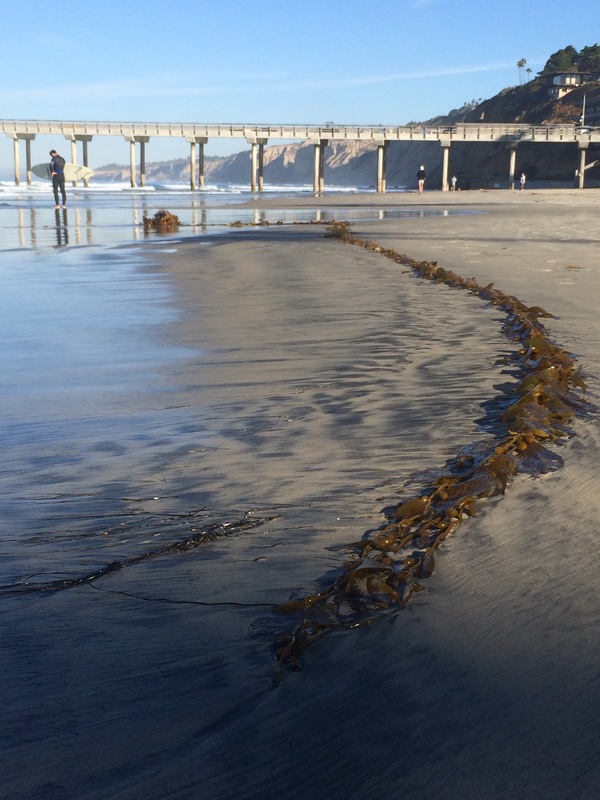 The beaches have seen some higher than usual tides lately, and along with the seaweed, a lot of junk washed up with the waves. Junk including freshly broken glass- ouch! And there were at least fifty barefoot surfers out enjoying the spectacular weather today… I don’t want to think of the potential harm that one big piece pictured above could inflict. Again, ouch! I had a short run of only couple of miles this morning, but still wound up with a fistful of glass to pitch into the trash. I’ve always told my kids to pick up trash on our walks and hikes, and it felt good to help take care of one of my favorite places to run and play. How lucky can you get? The people on Kenamar Drive- a little side street packed with industrial worksites- get not only Duck Foot Brewing, but a fabulous lunch spot, too. Thyme for Lunch has a menu board featuring breakfast and lunch offerings that can keep me coming back for months, I think, everything looked delicious. With design warehouses, a heating and cooling business and solar company nearby, the brewery and café must be cleaning up. We picked up a Prosciutto and Goat Cheese Panini with Fig Jam, and California Burritos bursting with both French Fries (a must in your CA burrito) and really good quality Carne Asada. I tried a different beer on this visit- the Choco Porter with Coffee… yum. Like most porters I’ve had, this was also lighter than the stouts but full and rich. Yum. We also brought home a growler of the Double White IPA for Thanksgiving… you’re welcome, family who will be drinking this with us next week! I’m glad The Husband spotted Thyme for Lunch last week while we came to Duck Foot, and we both had time to meet up in Miramar to bring our lunches into the brewery. 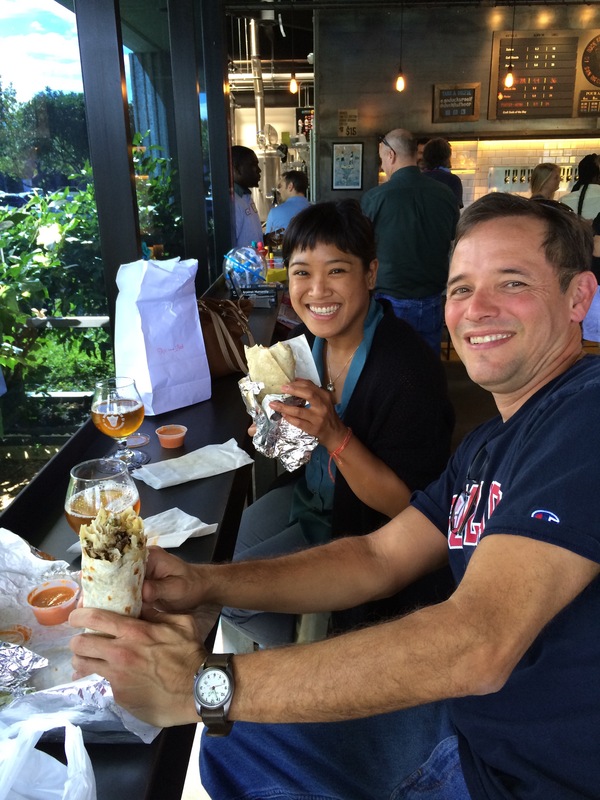 That is one of the great things we learned During San Diego Beer Week 2015- if the brewery doesn’t serve food, there is either a food truck for the crowd, or you can bring food into the establishments. So we did! And it was a great lunch, complete with Vanessa from his work, too. Hi, Vanessa! Great seeing you today!